Dr. Tarun Mittoo is a renowned Dentist in Amritsar. He has been a practicing Dentist for 12 years. He has completed Certified Implantologist. 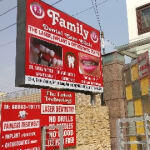 You can consult Dr. Tarun Mittoo at Family dental care clinic in green avenue, Amritsar. Book an appointment online with Dr. Tarun Mittoo on Lybrate.com. Lybrate.com has a nexus of the most experienced Dentists in India. You will find Dentists with more than 25 years of experience on Lybrate.com. You can find Dentists online in amritsar and from across India. View the profile of medical specialists and their reviews from other patients to make an informed decision. How to remove yellow colour from teeth? Please help Can we clean teeth in dental clinic? It will affective. It will long last. Everyone doesn't have pearl white teeth. Your teeth color matches your skin colour. You can go for scaling and polishing followed by bleaching for more whiter teeth. One of my friend his mouth is notopening properlly like 2 or three fingers can go inside his mouth.He is 20 right now But he used to eat taboco like chewing Now he smokes so just felt bad for him. Please advise. Most likely diagnosis is indeed Oral Submucous fibrosis. As for treatment, first and foremost, quit all tobacco and other habits, including paan and supari chewing. Then see a dentist or an Oral Surgeon and get a thorough evaluation. Sir, I have a problem regarding teeth sir, I have a problem regarding teeth & gums. During night's the blood is coming out from gums & bad smell is coming out from mouth at morning hours How can I overcome this problem sir. Its because of food deposition in gums which ultimately leads to gums infection causing gum loosening and bleeding. Tou should undergo Scaling of teeth (i.e cleaning of teeth and gums ) will remove any irritating factor causing gums infection and gums bleeding. Resukts will be excellent. Its a complete painless procedure. Scaling ultimately improves the health of the gums. Dear sir, recently I visited one dental surgeon for toothache/cavity. He made some root canalling treatment on the affected teeth. Is it mandatory to cover the teeth with a silver/metallic crown? please answer. Its need to cover the rct done tooth with cap. Whether you take silver or metallic crown that's your choice. One and half month before my mother took dental pain medicine from local medical shop without consulting the Doctor. From that day, she was suffering with more Saliva and bitter in her mouth, abdominal pain, Vomiting and diaria problem's. She couldn't take normal diet She could having liquid food only. Even If she eaten one piece Idly she getting Vomiting and pain in her abdominal. These problems were started slowly and then increased severely when we removed one of her teeth at the Dental Hospital due to more pain and swelling on the teeth. That time the Dental doctor said that my mother teeth were so weak and some of her teeth need to remove it. And also he said her teeth and gums got infected with more plague and fungal infections. The doctor suggested us to clean her teeth immediately. Initially, we thanked that my mother suffered with stomach ulcer and Iron deficiency problems. After few days only we noticed that her problems didn't decrease. She was suffered even more with Saliva and bitter in her mouth, abdominal pain, Vomiting and diaria problem's. Then only we realized that she was suffered with some chronic disease. And then we consulted with Dr. At Sudha Hospital, Royapuram, Chennai to diagnose the exact disease. The Doctor suggested us to take the ECG & CT scan to check my mother Heart, Liver, Kidney, Spleen and abdominal functions and also the Complete Blood Count Test. After taken all the suggested test only we came to know from the Doctor that my mother suffered with Acute Myeloid leukemia (Blood Cancer) disease. Due to my mother RBC and Platelet count very low we immediately admitted in the Rajiv Gandhi Govt Hospital in Chennai on 25.8.17 as per Dr. Balasubramaniam advice. She was under going treatment 15 days from 25.08.2017 to 09.09.2017. Due to her age problem the GH Doctor given only the low dosage of chemotherapy from 26.08.17 to 30.08.17 (5 days). At GH only we took Bone Marrow Aspiration test. The Bone Marrow Test report says 70% Blast on her Bone Marrow and CBC Report says 90% Blast on her blood. She was discharged on 09.09.2017 after 15 days treatment. The GH Doctor asked us to come after 15 days for the further follow up treatment. Now her abdominal pain feel better but didn't decrease fully. And she still having more Saliva and bitter in her mouth and couldn't eat the normal diet. How can we stop the excessive production of Saliva and bitter taste in Mouth. And can we cure the stomach ulcer problem while taking the blood cancer treatment or not? The stomach ulcer problem which happened by blood cancer or it is a another problem? Because my mother not able to take the normal diet. She said after drinking water, Milk or liquid food she having pain in her abdominal 10 to 15 minutes. After that the pain is reduced. Hello, She is suffering from gastric disorder. She should tk, plenty of water to hydrate her body. She should follow the diatery regulation advised by her Dr. She should tk, homoeopathic medicine: Calcarea carb 30-5 drops, thrice. Acid sulph 30-5 drops. Thrice. Report wkly, please. Tk, care. I have some problem in my teeth. How much amount will be required if I want to wash my teeth? Washing teeth may be charged depending upon the type of machine used, expertise of the doctor, I cant tell you exact charge, but may be somewhere around rupees 1500 or so. Lubricate your gums, whiten your teeth and floss with a simple home remedy. Slosh your mouth with coconut, sunflower or sesame oil for 15 minutes and then spit it out. Get that extra shine and improve the health of your teeth with this easy technique called oil pulling. Always wear a full-face helmet or a mouthguard while playing sports. It will protect your mouth from any unnecessary injury. I am from punjab my age is 37 male. Meri tung(jubaan )ka agla hissa 3/4 din se karva sa feel kar raha hai namak bhi fika lagta hai. Sirf aage se pichle hose me thik hai. This needs to be checked properly before giving you any suggestions. Also a proper history is needed. Hi I have pain on my left upper jaw and due to which feel facial Pain as well on left Head Skull and it remains on for entire day. I have this pain for last 15 years and done already MRI and found nothing. Now one of doctor has advised me to have Nerve Block treatment. Would like to know if it is safe or will have side-effects on my future life. My age is 45. Request your confirmation. Dear lybrate-user, nerve block treatment is generally safe if performed by a qualified practitioner. Any treatment can have its side effects. You should ask your treating doctor to explain the procedure and its side effects to you. You should also ask your doctor any questions and doubts you have. Your doctor knows what is the procedure to be performed. To understand your problem in detail I would like t have your symptoms and reports in detail. You may consult me or have a second opinion by a qualified practitioner.